OCV. 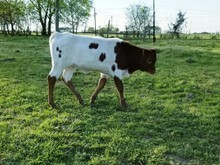 Here is a great Bob Loomis branded cow to add to your herd that is bred up by some of the bust in the industry. She is a direct daughter of the famous JP Rio Grande and Grand Daughter Farlap Chex. This Tari Family blood lines brings some of the top programs and high selling lots together. We have bred to our Herd Sire Big Red HR who is 84 inches ttt at only 4 years old! Big Red HR is an embryo full brother to Rowdy HR and another full brother to the $80,000 HR Slam’s Rose, the 80 inch tip-to-tip daughter of J. R. Grand Slam. BL RIO TARI is an own daughter of JP RIO GRANDE. 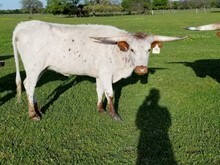 She is a white cow with, lightly freckled with red spots and she has high handle bar horns, that are rolling over. She is still adding length to her horns. Check out her measurements! TARI has a gorgeous red and white painted heifer on the ground that was born, 12/20/18. Her Sire is WS ELEVATION. He was 78 inches by 3 years old and is now in the 80s!